Celebrate the Festival of Lights with this fabulous, festively wrapped Hanukkah gift arrangement. Available in two sizes. Celebrate the Festival of Lights with this fabulous deluxe Hanukkah Gift arrangement! From festively wrapped chocolate creations, to our 100% kosher Wild Alaska Smoked Salmon, they are going to absolutely love this oversized holiday gift basket! 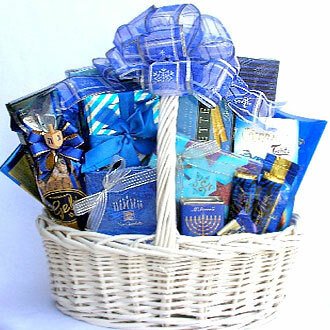 This beautiful Hanukkah gift basket helps recognize and celebrate the Festival of Lights that is the Hanukkah holiday. Available in two sizes. Select desired size at checkout. Medium/Large: $105.00 This beauty offers such an abundance of gourmet goodies, that they will have more than enough delicious treats and sweets to last throughout their eight days of celebrating! A large painted white basket boasts a bountiful selection of kosher treats which includes, fine Hanukkah Chocolates, Caramel Nut Clusters enrobed in creamy Milk Chocolate, Chocolate Coconut Creations, a Hanukkah themed bag of Kosher Chocolate Chip Cookies and Gelt, tied with a bow and a dreidel, Ghirardelli mini bars, Chocolate Covered Pecans, Apple & Cinnamon filled Studel Cookies, rich Milk Chocolate Truffles, Parmesan & Herb Artisan Hors D'Oeuvre Crackers, Wild Alaskan Smoked Salmon and Camembert Cheese Spread! Large/X-Large - Shown: $140.00 Our deluxe ìFestival of Lightsî is even more impressive, with an even larger white basket that offers everything mentioned above plus, gourmet nutty Snack Mix, Belgian Chocolate Seashells, Milk Chocolate Cappuccino Biscotti Joys, Hazelnut Cream filled Wafer Cookies, Mint Fudge filled Chocolates, White Chocolate Almondine Ghirardelli Coffee, Cranberry Bog Frogs (cranberries, caramel and nuts mixed in creamy chocolate) and Pure Milk Chocolate Covered Almonds!